Surely no one doubts changes in the GRS on Jupiter from the late 19th century until now. And, I doubt any student of Saturn and Ring Theory would dismiss the possibility or even the likelyhodd of some change over time. And, btw for those wanting to negate visual observations of Ring divisions and only rely on spacecraft observations you need to look at the drawing of Saturn's Rings by Loyt made in 1943 with the 23-inch Pic-du-Midi refractor. Looks just like a Voyager spacecraft image only beats it by several decades! see plate XVII in Alexander's superb book, The Planet saturn. I have great respect for early visual observers like Dawes, Lyot, TER Phillips, WF Denning, Antoniadi, Schmidt, Fauth ,and many others. I own TMB 8" and 10" F/9 apos and believe I have on rare occasion glimpsed, just glimpsed, flickeriong in and out of view, the Enke division under superb seeing. Never able to "hold it" in view. I guess i am not comfortable with the casual dismissal of 150+ years of observational record created by observers as dedicated and skilled as any alive today in favor of an utterly unsupported long term steady state version of planetary ring structure as (uniquely) proposed here. Well, I think you may be reading a little too much into this discussion. It more refers to the real division near the edge of the A-ring and what aperture it would take to reveal it than about what was reported historically. Observations over the past 150 years (visual included) *have* been vital in determining what is present on the planets. As far as I can tell by reading the thread, *no one* has suggested just casually dismissing anything which isn't necessarily confirmed by space probes. The first reliable maps of the moon and the albedo features on Mars both came from visual observations and hand drawings, as did the discovery of Crepe ring and Cassini Division of Saturn's rings. Changes have also been reported, although in large part, they were planetary atmospheric changes which had multiple observations backing them up. A recent example of a rare visual observation of value are the flares on Mars, which turned out to be a very real phenomena. However, a few things also came from visual observers which we know may be a bit dubious at best ("spokes" of Venus, the "vanishing" of the Lunar crater Linne, Lowell's network of "canals" on Mars, ect.) These were usually possible details which were at the limits of visual acuity and instrumentational resolution. That, coupled with the fact that it was the human mind that was intepreting what the eye was seeing, makes for a less than "hard" scientfic observation, especially considering others did not report many of these details. People make mistakes and don't always report things quite as they really are, but only as their mind and understanding interprets them. The large but partially burried lunar crater Cassini was not recorded on maps prior to 1692. Does that mean that the crater did not exist prior to that date? Probably not, as it was probably just overlooked, again by fallible human observers. The Crepe ring was not reported until 1850, but does that mean that it did not exist prior to that date? Again, it probably got overlooked by the observer's of the time (it has low contrast and does require good seeing to make its inner edge look sharp, rather than appearing just as a diffuse inner edge of the B-ring). Perhaps early observers merely thought the C-ring was just a diffuse extension of the B-ring, so never really made it a point to prounounce its existance as a somewhat separate entity. 1: the ring system changes on a relatively rapid basis, short enough to allow some observers to report a division with a variety of thicknesses and locations while other competent observers do not report any such divisions? 2: images taken over a 25 year period showing little change in the overall appearance of the ring system may indicate that early visual observers may have merely been mistaken when reporting some ring divisions? As for me, while I won't exactly write-off changes in the structure of the Saturnian ring system over long periods of time, I tend to take the #2 approach as being the more likely. The closeness of the 1888 Keeler drawing to what was revealed in some of the Voyager images tends to support the long-term (ie: less than 200-year) gross feature stabililty argument. As for the Encke feature(s), many years ago, I saw for only a few moments what I thought was a diffuse division in the middle of the A-ring at around 200x, but at higher power, it tended to go away. After studying the brightness profile of the ring system (from research by M. Camichel and A. Dollfus), it became obvious that what I was seeing was a contrast effect caused by the bright inner edge of the A-ring and the brightness falloff towards its outer edge, coupled with what the shape of the ring system suggests to the eye. I went for many many years before I actually got a night good enough to catch just a bit of the fine dark division which now bears the Encke label in my 10 inch Newtonian at powers greater than 350x. It was so marginal that I concluded that it would probably not be visible in an aperture significantly smaller than 10 inches, and the optical analysis of the location and angular dimensions of the true division tend to support this conclusion. Clear skies to you. This is really a great year to at least try and see the Encke, even if it's just the minima. A friend of mine mentioned to me that you had some comments about my The Encke Minima and Encke Division in Saturn's A-Ring article so I thought I would respond to you. I set up an account on CloudyNights this morning. First, I would like to clarify why I wrote the article. One was to help clear up the differences between the Encke Minima and Encke Division, which seemed to be confusing to many observers. Secondly, I wanted to determine why some observers reported they could only see the Encke Division with larger aperture telescopes, such as 10" or larger (including Keeler with the 36" refractor), while Dawes was able to see it with his 6-1/3" refractor. So I began to think about what some of these factors might be. After doing an historic literature search and addition research on the topic some these factors seemed to include excellent seeing conditions, how wide open or closed the rings were, and the elevation of Saturn in the sky. The C-Ring had been seen at least as far back as 1793 by William Herschel, as he recorded it in a sketch and it is clearly seen across the front of the globe. Unfortunately he thought it was only the shadow of the B-Ring rather than a separate ring. Also if you take a look at Kater's sketch on my web page there appears to be some haziness in front of the globe which may have been the C-Ring. In addition William Lassell and William Dawes using Lassell's 9" f/12 equatorially mounted reflector reported seeing the Encke Minima and the Encke Division in September 1843. They may not have noted the Crepe Ring at that time as Saturn was low in the sky, but this does not invalidate their observations of the Encke Minima and the Encke Division. >have been visible at the threshold. This is incorrect. Take a look at O'Meara's and Sheehan's sketches of Saturn in the January 1993 issue of S&T where they used a 36" refractor. Also Lyot made a sketch using a 24" refractor that showed similar detail. The aperture of the telescopes that O'Meara's, Sheehan's and Lyot were larger than the 15" refractor that Coolidge used but this does not mean he did not see this detail. Dawes is a good example of this as he often saw detail in his smaller aperture telescope than other observers did who used larger aperture ones. For example Dawes independently discovered Saturn's C-Ring along with the Bond's: Dawes using his 6-1/3" refractor, the Bond's using 15" refractor. It may be harder to make the case that Kater saw the same detail as Coolidge did but their sketches show similar detail, and Dawes noted how the detail that he and Lassell saw that night they first saw the Encke Minima and the Encke Division was very similar to Kater's drawing from 1825. >me regarding Kater's and other historical observations. Agreed, and I feel I need to say something about these observers who are taking heat for their observations. First, Captain Henry Kater was the Vice-President and Treasurer of the Royal Society. In his obituary it was noted that he was "both a delicate experimenter and an accurate observer, is abundantly proved by the various papers, which are published, in the Philosophical Transactions". He received a gold medal from the Royal Astronomical Society in 1831 for his contributions to astronomy. I read Kater's original report that he presented to the astronomical society on his Saturn observation. He very carefully laid out the observing conditions and the detail he saw. He did not present his observations until 1830, as he wanted to confirm the detail he recorded through additional observations and those of others. In addition, Coolidge was a very skilled and dedicated observer. In 1853 he was appointed Assistant Astronomer to the Japan Exploring Expedition, which included the North Pacific Ocean and China Sea. In preparation for this he worked for some time under George Phillips Bond at the Harvard Observatory. He returned to the Harvard Observatory in the fall of 1854 as a volunteer assistant and continued at intervals until the end of March 1860. In 1858 he was appointed as Astronomer for an expedition to survey the country between Vera Cruz and Mexico City to determine the line of a railroad. However, a civil was broke out in Mexico at this time, and with his interest in the military he accepted an offer as the position of aide-de-camp to the general leading the constitution forces. The constitutional forces lost, and Sidney Coolidge was thrown into prison and sentenced to be shot. Fortunately word got back to his friends in the United States, and the government intervened on his behalf. I have read through Coolidge's observing reports. When observing he would take page after page of careful notes describing in detail what he was seeing, and make detailed sketches. He noted also the importance of training the eye to see more detail. It should be noted that it was from reading Coolidge observations of Saturn that O'Meara saw this curious annotation: "The inner two thirds have the same streaky appearance noticed before." This lead O'Meara in the course of his own observations at the Harvard Observatory using the 15" and 9" refractors to record spokes in Saturn's B-Ring. He followed them for four years and presented a talk to a professional Saturn conference on the variability of the spokes before the Voyager spacecraft imaged and confirmed them. In closing it is not clear to me why some on this list feel the need to dismiss the observations made by these astronomers between 180 and 150 years ago, simply because they cannot see the same detail in their telescopes. These astronomers were highly respected by their peers and in their own ways made important contributions to astronomy. In each case they did what all good scientists do: make careful observations, accurately and honestly record what they saw, and then look for corroborating evidence. In turn their observations were used by fellow astronomers to confirm other observations (and in the case of Coolidge, leave an important clue to what is now taken for granted, that Saturn has spokes in it's rings). It is because of this they are still remembered to this day. Any way to move the historical argument to another thread? the 36" is not a refractor. >the 36" is not a refractor. In addition the telescope that O'Meara and Sheehan used is a 1-meter not 36". Welcome to Cloudy Nights Sir. See my above revision and thank you for your patience. I think a distinction should be made between "seeing" and "detecting". I consider myself very fortunate because I have had acess to relatively large telescopes and also very steady skies. I have clearly seen the Enke division many times with a 22 inch reflector. I have also seen it using a good 8 inch reflector; no, it was not anywhere as clear as with the bigger scope and it was only visible at the edge of the ansae. And no, it was not the minima, you can see that with any 5 inch instrument and it is a very different animal. As with the deep sky buffs that seek dark skies, the planetary buffs seek steady conditions. Anybody that is interested in astronomy should treat themselves to both every once in a while. Perfectly clear skies are rare but also relatively more common in certain parts of the country. I'm lucky to live in one of those locations. When these conditions exist, the views with a good scope rival those obtained with the newer CCD equipment. I stand by my claim that I have never seen a CCD picture of Saturn that is better than some of the views I have been lucky enough to see with my own eyes. You can definitely see the Enke division with an 8 inch under exeptionally good conditions. Just do not expect it to be anything like the Cassini division. I've read a bit and also learned a lot regarding observing the Encke Division this thread. Thanks to all of you. Though I don't believe I've seen it, I offer this. That is an *excellent* drawing Sol! It shows the "Encke Minimum" quite well in the middle of the A-ring (and maybe just a hint of the darkening where the Encke Division is). It must have taken a lot of patience and effort to get this kind of quality drawing. Keep up the good work and clear skies to you. Thank you for the complimentary words. It looks like Sol's drawing shows a definite possibility of Encke gap detection. It also illustrates how the CCD- processed images do not do Saturn fair justice. Too much ring detail is washed-out in the processing, or maybe the detail was not even there because of seeing conditions. At any rate, I have seen many of Sol's Saturn drawings before and they come a lot closer to what I have seen. My own drawings are nowhere near that quality. Now, my question is, what is a Guan Sheng Newtonian? GSO, Guan Sheng Optics is a Taiwn-based manufacturer of eyepieces and telescopes, mostly under private label to many of the world's companies. Look carefully, and you will see a lot of familiar products. Guan Sheng manufactures a lot different badged scopes. My mirror came from Anteres in Canada. Guan Sheng also made or makes scopes for Orion, Celestron, Hardin and others. they get mirrors from both Synta and Guan Sheng. They randomly test batches of mirrors and the better ones get set aside with a better optical grade. I simply wanted a mirror that had no turned edge, zones, etc. My Newt star tests at about 1/6 wave at the eyepiece. Though I didn't optimize my scope for planetary observing, it does a relatively decent job. I'm proud to bump back up this thread, which started more than a year ago, mostly thanks to my obviously bad reports that I had seen the Encke Division with an 8". I'm pushing the 12" at 375x (with a 4mm radian) (I can get 600x but will never achieve focus there! ), with a seeing at 8, or so I assess. Monday I used 500x but the dob's mount is too shaky for that. 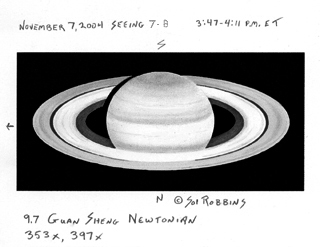 I can see the "equatorial" belt of Saturn, and two thinner belts a little like what Sol's drawing shows (including the lower belt which is lost in the "glare" of the white area, and of course the Polar region (which still does not appear green to me, sorry Ron. The C ring is plainly visible as its shadow; the "irregularities" in brightness of the inside of the B ring; Cassini, and what looks tantalizingly like the Encke division, a little darker than what we can see on the outer edge of the A ring in sol's sketch (the "ansae" made by the visible parts of the division extend a little farther too). What makes me think it's Encke is that the width of the A ring between the "feature" and its outer edge is about the same width as the Cassini Division - calculated by you guys to both be somewhere between .5" and .7". I'll try making a sketch. The image is pretty much printed on my retina now. So, are we getting closer? Now I saw somewhere else a pic of Saturn showing a division on the outer quarter of the C-ring. Hmmm ... sounds like a job for a 16" APO! "Figures often quoted as the resolving limits of telescopes only apply to point sources of equal brightness or to double stars resolution....Planets are extended objects, so these values don't apply to planetary detail....At the turn of the 20th century, famed astronomer William H. Pickering conducted experiments inot the resolution of planetary detail. Pickering found that a dark spot on a bright background could be resolved to a level a little more than twice as good as the Dawes value. Perhaps the most famous example of this is the discovery of Saturn's Cassini Division made with a 2.5 inch refractor. This observation exceeds Dawes Limit by nearly a factor of 3 for this aperture. (The Cassini Division spans no more than 0.7" at any time, and the Dawes Limit for a 2.5 inch telescope is 1.8".)" I suppose this kind of info helps support stated observations of the Encke Division in relatively small scopes. David K reported above in this thread that the Encke Division is only 0.5" from the edge of the A ring. David pointed out that in fact, it's "worse" than this, because separation of parallel lines need to be 1.1 to 1.4 that of Dawes Limit to be resolved. This would mean scopes may need to resolve down to as low as 0.45" - 0.36" to resolve the feature, and thus limits this feature to scopes of 10 - 12" or more. But based on info in the above quote (based on experiment evidence), this resolution limit can be relaxed by perhaps up to 2.5x (probably if contrast is really high...e.g., black on white), but maybe more realistically only to 1.5x to 2x (because Encke divsion is black on GRAY, not black on white). Assuming a pessimistic case (the 1.5x case), a scope that can resolve down to maybe 0.54" (1.5 * 0.36") or 0.68" (1.5 * 0.45") has a shot at seeing the Encke Division. These values are in the ballpark of an 8" scope's capability. More optimistic values (the 2x case) of 0.71" (2 * 0.36") to 0.91" (2* 0.45") put the Encke Division in the realm of a 6" scope's abilities, and I have heard reports of this target being seein in 6" refractors. Incidentally, Sol says he doesn't think he's ever seen the Encke Division, but check out his drawing! On my monitor, his drawing shows the narrowest of lines right at the very very edge of the A-ring. Looks like E.D. to me! David Knisely pointed this out also: "maybe just a hint of darkening where the Encke Division is". Well, you have got it a little backwards. The smaller the resolution figure, the higher the resolution of the telescope is said to be and the finer the detail is that can be resolved by the scope. The 1.1 to 1.5 times Dawes figure is the resolution for a given aperture and represents a *drop* in a telescope's resolution capability for that kind of detail (i.e. it isn't resolving as small an angular detail as for a pair of point sources like a double star). For a 10 inch, this effect on somewhat linear features *decreases* the scope's effective resolution capability from a nominal Dawes 0.46 arc seconds (point sources) to from 0.51 to 0.69 arc seconds (for a pair of parallel lines). Thus, for linear features, the resolution of the 10 inch has *decreased* to something found on a smaller scope like a 9 to 7 inch aperture. At mean opposition, the Encke division is about 0.5 arc seconds away from the outer edge of the A-ring. This is *smaller* than the effective resolution for a pair of equal lines that a 10 inch can probably separate, and thus the division might not get resolved to become visible. Even being somewhat optimistic about things, it would take at *least* a ten inch and perhaps something as large as a 13.7 inch aperture, since for linear detail, the separation (0.5" arc) is too small to be resolved. For this reason (and my own experience observing the Encke division), I have significant doubts that telescopes smaller than 10 inches can clearly resolve the division from the outer edge of the A-ring. Clear skies to you. No David, I don't think I've got it backwards, though I apologize if I was unclear in how I described things. Like you said, the 1.1 to 1.4x Dawes figure represents a drop in the scope's ability to resolve. So, a 0.5" feature becomes more like a 0.45" to 0.36" feature (as I wrote above). And thus a scope of 10-12 inches is required instead of a scope of 9 inches (just like you said originally). I haven't said anything contradictory here. My point is that while the parallel-line argument works against you (by 1.1 to 1.4x), the extended object argument (that I cited in Astronomy article) works in favor by up to 2.5x (though probably less so in this case because Encke Div is black on gray...hence my more pessimistic "adjustment" of 1.5x). The net gain is in favor of the observer. Well, there are still problems with using the parallel line argument. First, the Encke division and the darkness of the A-ring next to it are not sitting against a white background as was present when the line resolution experiments mentioned in Sidgwick were done. This will reduce the contrast somewhat and make seeing the division more difficult. Second, the Encke division and the darkness of the A-ring are not quite two very thin parallel lines, but are arcs. This may make things more difficult. If you want to take the "discovery" comparison, the Cassini Division was discovered using a 2.5 inch telescope, although I have done a series of resolution experiments indicating that, for full ring tilt, the threshold of bare detectability is more like 2 inches. The Cassini division is about 2.3 arc seconds from the outer edge of the A-ring at mean opposition, while the Encke Division is about 0.5 arc seconds out. This is a factor of 4.6 in angle change, so instead of 2 inches needed to just barely show the division, the Encke would now require roughly 9.2 inches. Again, this comparison wouldn't be quite fair, as the Cassini Division is much thicker relative to the size of the A-ring than the Encke Division is, so one would expect it to take a bit larger aperture than 9.2 inches to resolve the Encke from the outer edge of the A-ring. It also takes a lot of power to bring the scale of this 0.5 arc second distance to a point where it can easily be viewed by the eye. Assuming you need to get it to a scale like that of the wide components of Epsilon Lyrae (3.5 arc minutes which is near the limits of the unaided eye), you would need around 420x. Clearly, you need enough aperture to support this power, and again, this argues for something definitely larger than 9 inches. The time I have seen the Encke Division in my 10 inch Newtonian, the division was fairly marginal, and it took between 400x and 500x to even get much of a glimse of it. Thus, I remain somewhat skeptical of reports of the division's visiblity in 8 inch and smaller apertures. Clear skies to you. Over the course of the last 3.5 weeks I've been fortunate to have 3 nights of exceptional seeing. For two of those nights I was using my 12.5" Portaball. I've had it for about 19 months and until these two nights I have never been able to say that I had seen the Encke Division. I use a Nagler 3-6 Zoom for high-power viewing and I needed to use the 4mm setting at the minimum to see Encke (giving me about 380x). One night it was quite sharp and the following night I was getting fleeting glances of the division (nonetheless it was there). On Saturday night the seeing was incredible once again and I was working at a local resort's observatory. The observatory has a 16" SCT and Saturn was _tack_ sharp. There wasn't a hint of any movement. Unfortunately, the highest power ep they have couldn't be found so I could only take the scope up to 320x. Even with the excellent seeing, I could not see the Encke Division at that magnification. Unfortunately, it was after 11:30 p.m. when I returned home and Saturn was too low for me to look at with my Portaball. I was able to see Jupiter like never before though.